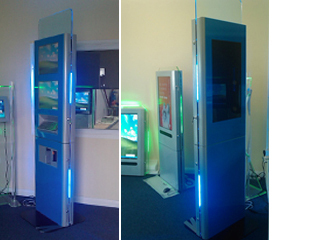 This 2 metre tall kiosk, comes with lower interactive 19'' display and a second, higher passive 19'' display for advertising purposes. At the rear of the unit a large passive of interactive third screen could replace the static advertisment area. Developed with and available exclusively through TopScreen Media, this impressive unit is based on our standard proven technology, this new design brings a multiple screen options, to allow greater flexibility. It is also available with point of sale and transactional options such as chip and pin readers.